The Avengers rewrote the record books with the biggest ever opening three-day weekend that’s estimated at $200.5 million. With $30 million more than the former champ, there’s little chance that the Monday actual will change Sunday’s ebullience. The film was anticipated to open at $155 million-$165 million and had already done close to $300 million in its opening week in internationally, where it premiered in 30 territories prior to the U.S. So, the other majors all decided there was little point to bother to offer up counter-programming. There was still a lot to be said for the limited bow of The Best Exotic Marigold Hotel that racked up $727,000 from a meager 27 engagements. The yarn of senior Brits looking for a golden age life in India has already amassed $70 million internationally. Apart from the ballet nonfiction First Position that grossed $44,800 on five screen, incoming exclusives were ho-hum. The Avengers accounted for roughly 80% of the weekend’s $250 million ticket tally. Its entry into the marketplace boosted revenues from last weekend by 131% and improved on last year’s record by 53%. In 2011 the marketplace leader was the Marvelously debuting Thor with $65.7 million with Fast Five as the runner up with $32.4 million in its sophomore session. The industry rule of thumb is that cinematic behemoths going the Midnight advance route can expect 10-to-1 returns. The Friday announcement that The Avengers had accrued about $18.7 million from early screenings was unquestionably heartening. Removing that portion of the box office from the overall picture was provided a not insignificant Friday-Saturday box office boost and early estimates of $170 million to $180 million were quickly revised. The response at Disney was not unexpectedly fulsome though they were hard-pressed to explain the better-than-anticipated returns. Distribution EVP Dave Hollis credited Marvel for cleverly “seeding the market” by successfully introducing the likes of Iron Man, Thor and Captain America in earlier film and establishing a movie fan base. Exit demos revealed a 50/50 split for the over/under 25-year-olds with an overall 60% skew toward males. However, with response at this lofty level the size, regardless of demographic, was considerable. Roughly 52% of revenues derived from 3D engagements which accounted for 75% of the screen count. Imax engagements were 8% of the tally but they will largely disappear next weekend as they’ve been committed to the opening of Dark Shadows. In general holdover titles took hits of 50% to 65%. 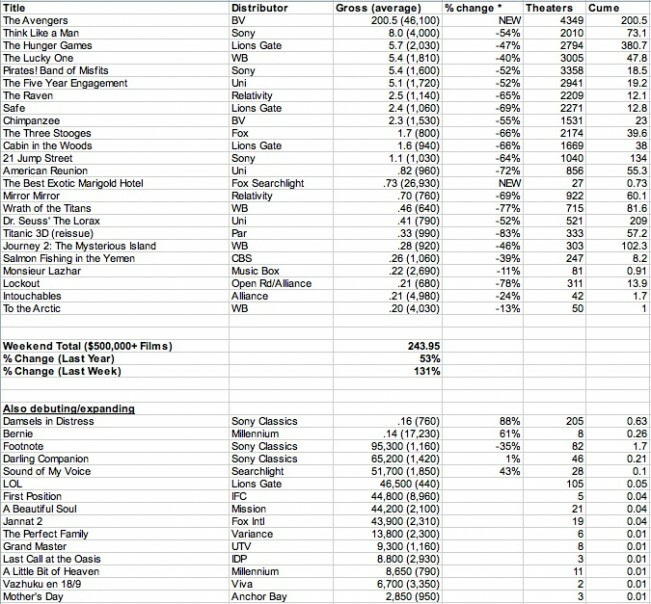 The Hunger Games ascended into the top 15 all-time box office grossers and, Avengers notwithstanding, should settle in at position 13. The French sensation Intouchables continues to perform in Québec at a level that’s comparable to international grosses that are nearing $350 million. 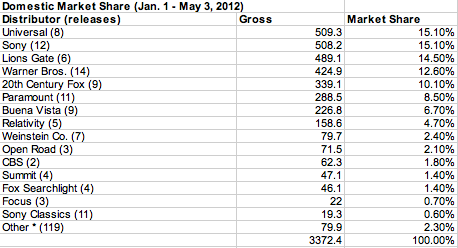 Its U.S. distributor would be thrilled to equal some vaguely proportional to Québec’s current $1.7 million box office.